like you know what you're doing." My Sweet and I have seven kids. And because that is the perfect number, we are going to stop. Or because we have reached our max and don’t want to spend the rest of our lives on a therapist’s couch. Either way, seven is our number. All families have their number. As we have more babies, we adjust our standards, don’t we? We reevaluate our focus, our time, and the final resting place of boogers. I would once have been appalled at the things I now let slide. That first-born kid of ours was squeaky clean. Oh my gosh. One evening long ago, some friends asked us, “How often do you bathe your kid?” We gave them a confused look. “Every night.” They thought we were crazy and now so do I. When the firstborn dropped his cup of Cheerios on Grandma’s floor, they were pronounced garbage. Last week I saw my baby eat his raisins from the therapy room carpet. And I turned my head and pretended to be interested in the posters on the wall. When Baby #1 was gifted sweet little shoes, those (useless) shoes made their way onto baby’s feet. When Baby #7 was gifted sweet little shoes, mom knew that they would make an excellent re-gift. To a first-time mom. Firstborn didn’t know what candy was until we needed potty leverage. And school parties introduced him to pop. The baby? 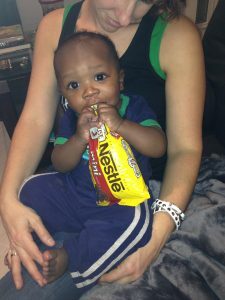 He toddles into the kitchen and stretches his chubby hands up to the countertops, feeling for Hershey kisses. A shame. When Baby #1 left the house, a roll-behind suitcase accompanied him. The zipper scarcely concealed a dozen diapers, medicine, two changes of clothing, a pacifier, extra pacifier, an extra-extra pacifier, and a packet of formula (even though Baby #1 was exclusively breast-fed). When Babies #4/5/6/7 left the house, there was always the hope that a diaper was stuffed under the seat as the van turned around for the forgotten bottle sitting on the kitchen counter. Firstborn’s baby book had a prominent place on the shelf for easy access. Every few weeks, it was update time! Now when mom sits down to fill in Lastborn’s baby book, she had better have the most freaking awesome memory in the history of parenthood. If that firstborn managed to find something to rip apart under your ever watchful eye, it came to a screeching halt. When that last born is caught making a horrific mess, there is a quick-fire argument in the parent brain between Entertainment and CleanUp. Entertainment has a very persuasive voice. When that first kid left the house, he looked good. If he was wearing stripes, no checks were found on this body. Red on red? Never happened. Flowers with polka dots? Couldn’t, shouldn’t wouldn’t. When that last kid leaves the house, he occasionally has his shoes with him. And by with him I mean if he digs around in the van, surely he will come up with something. The only clothing rule that applies to last borns is this: wearing clothes is good. 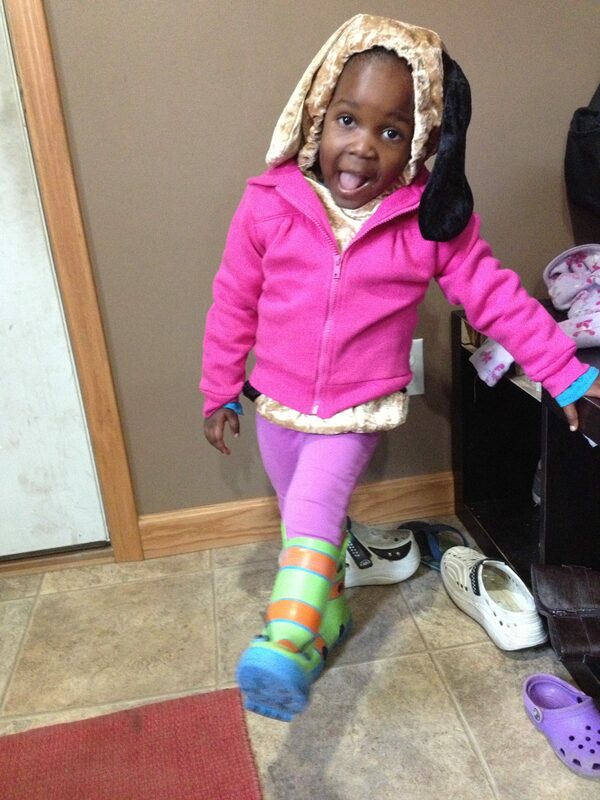 A puppy costume and caterpillar boots? That works. 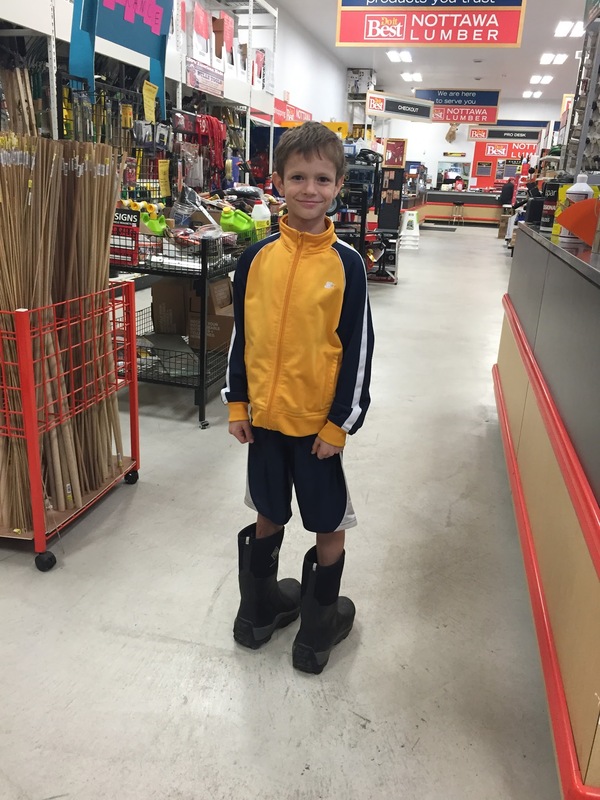 Dad’s boots? Worn backwards to the hardware store? Why not. 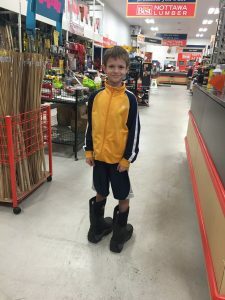 So if you see me and my slightly dirty toddler walking through the grocery store with mis-matched boots and a lollipop in his ever-smiling mouth, rest assured that I was once a good parent. And today, I am a slightly adjusted GOOD PARENT. I’ll bet you are too, no matter how many kids you have. So I guess now I know why we stopped at two: our standards plummeted already. 🤣 No, but seriously, I love your humor and truth combination. It highlights the necessity to major on the majors and let the boogers, er, fall where they may. Thanks, Carissa! It is nice that your standards hit the floor so quickly. Nice job! It's less stressful that way. First Time Me vs. Adjusted Me. That sounds like a great title!